After steam distilling, precious Rose oil's hydrating fragrant residue becomes the finest Rosewater. 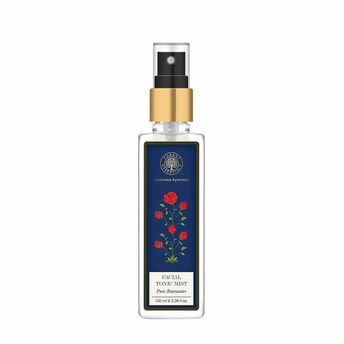 This fine quality Rosewater has properties for cooling, soothing and moisturizing the skin. Explore the entire range of Toners & Mists available on Nykaa. Shop more Forest Essentials products here.You can browse through the complete world of Forest Essentials Toners & Mists .Alternatively, you can also find many more products from the Forest Essentials Facial Tonic Mist Pure Rosewater range.